Buy this item and earn 23 ClubPoints. 3-in-One KVM cable to interface a VGA monitor and a PS/2 keyboard and mouse. • No Ghosting & No Degradation – Guaranteed. Ghosts, shadows, or streaks in picture adjacent to vertical edges may be a cause of faulty cables/termination. VPI cables are manufactured with the highest standards and provide a solid image with no ghosting & no degradation – guaranteed. 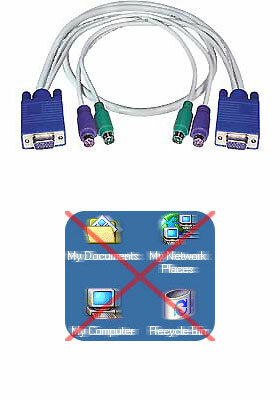 • 3-in-1 KVM cable interfaces a VGA monitor and a PS/2 keyboard and mouse up to 100 feet with a single cable run. • Use this cable to connect a PC to a KVM switch. • All male connectors on both ends.